For anyone who has ever had a new car, or even a new to you car in excellent condition, do you remember what it was like anticipating that first scratch, dent or door ding? My parents always bought new while I was growing up, so I remember going through that phase about every 3 or 4 years. When that first scratch or door ding finally does happen, it’s devastating. But you get over it, life goes on, and many more tend to follow. However we’re not talking regular old mommy missiles here. Instead Ferrari, Lamborghini, Porsche, Aston Martin and other fine European exotics. Cars that regularly go their entire lives without a single noticeable scratch. Largely that’s due to these cars not spending much time on the road, and rarely in inclement weather. For those who actually choose to DRIVE their exotics (what a novel concept that is! ), enjoying them to their fullest, you’re bound to get a scratch here and there. It’s okay, they weren’t built to sit in garages or museums. 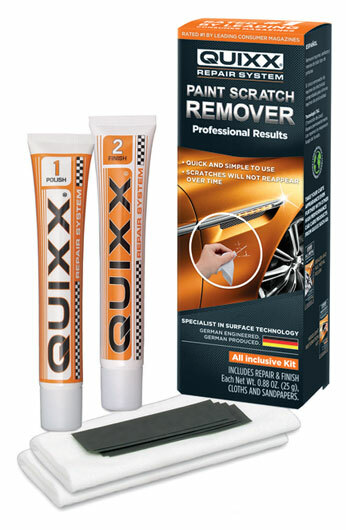 P aint Scratch Remover – A two-step process that not only removes the scratch, but also keeps it from returning. 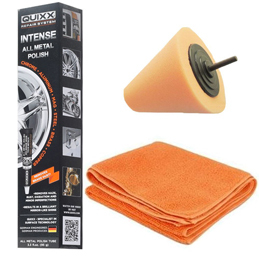 All Metal Polish Kit – This kit includes a polish that cleans and products for up to 6 months, a microfiber towel and energy cone you can attach to a drill to polish uncoated surfaces. Headlight Restoration Kit – Restores your foggy/hazy or yellowed headlights to their original glory. Paint Repair Pen – For those scratches that go down to the bare metal, this product will fill the scratch and prevent further damage to the area. Quixx sent me all four products to try. The two products I found to be most useful are the Paint Scratch Remover and All Metal Polish Kit. Both kits come with all of the parts you’ll need to successfully use each. The Paint Scratch Remover is probably my favorite. As I mentioned, I’m a firm believer in using and enjoying your toys. I believe it applies to cars, pens, watches, etc. They’re meant to be enjoyed. As a result, you’re always going to have little mishaps, especially in parking lots. The Paint Scratch Remover does a fabulous job at removing the scratches. The two-step process is simple and easy to follow. Results are impressive. The other product I found myself most drawn to is the All Metal Polish Kit. 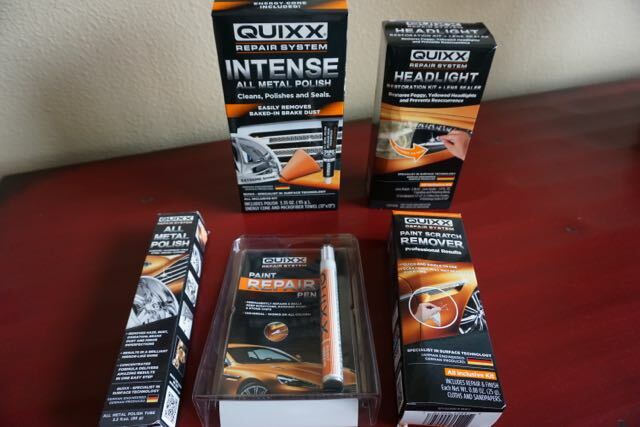 Quixx offers two different products. The All Metal Polish on it’s own, and the kit form which includes the items mentioned in the bulleted list above. Personally, I think the kit is the way to go. The All Metal Polish will shine up your wheels, grill or other shiny metal surfaces making your car look like it just rolled off the factory floor. Two things I LOVE about new or freshly detailed cars (aside from the usual wash job inside and out): polished wheels and shiny tires. I’m always after that detailed look. It makes driving around on a sunny day that much better. Kind of like drinking coffee out of a ceramic mug. It’s just the way it’s supposed to be. This kit will take care of the metal side of things. I was planning on giving all of the products away, but I’m so impressed that I’m keeping them in my car care “toolkit” in my garage. Each plays a different part in the daily car care process. In fact, I’m planning on some touch up on my other less exotic vehicles. After all, who doesn’t love a detailed car?! Check out the Quixx products online at Quixx-USA.com.